What is the Goal Seek Excel function? The Goal Seek Excel function (often referred to as What-if-Analysis) is a method of solving for a desired output by changing an assumption that drives it. The function essentially uses a trial and error approach to back-solving the problem by plugging in guesses until it arrives at the answer. For example, if the formula for revenue is equal to the number of units sold multiplied by the selling price, Goal Seek can determine how many units have to be sold to reach $1 million of revenue, if the selling price is known. The function is extremely useful for performing sensitivity analysisWhat is Sensitivity Analysis?Sensitivity Analysis is a tool used in financial modeling to analyze how the different values for a set of independent variables affect a dependent variable under certain specific conditions. Sensitivity Analysis is performed in Excel to asses risks, measure potential outcomes, and plan for an uncertain future in financial modeling. Let’s look at a simple exercise first, to see how goal seek works. Suppose we have a very basic model that takes the number of units sold, the retail price, and a discount to calculate total net revenue. Now suppose we want to find out how many units have to be sold to reach $20,000 of revenue. See the screenshot below and follow the steps listed to use the Goal Seek Excel tool. Below is the output from the analysis. We can see that to achieve $20,000 of revenue, 889 units need to be sold. Notice that the solution is displayed directly in the cell (E4), not in the dialogue box. Press OK to keep the solution running in the model (cell E4 will permanently change to 889 units), or press Cancel to return to the original assumption (500 units). 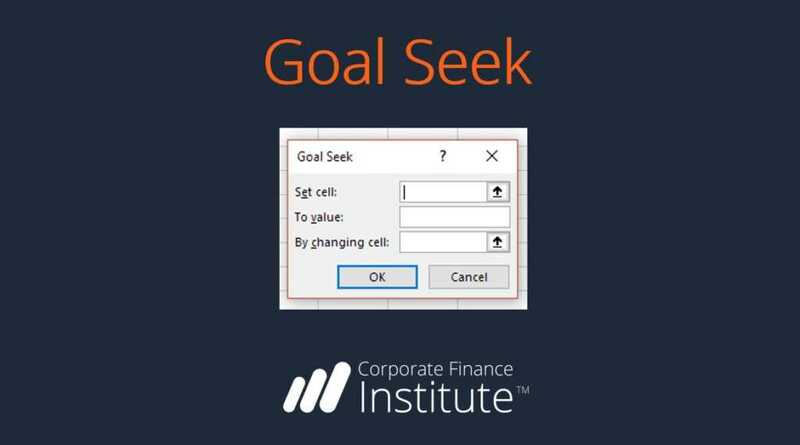 Here is a more advanced video demonstration of how to use the Goal Seek Excel function. This video clip is an excerpt from CFI’s Free Excel Crash Course as recorded by Tim VipondTim VipondTim Vipond is the Chief Executive Officer at the Corporate Finance Institue, a leading global provider of online financial analyst training & certifications. Lifelong learning is no longer optional. Modern financial analysts require a well-rounded skill set that takes time to acquire: theory, application, intuition, CEO at the Corporate Finance Institute®. Suppose you want to find the NPV equal to $500 million based on a certain discount rate. In order to do that, what I’m going to do is use the GOAL SEEK Excel function. I’m going to press Alt, A, W, and G for GOAL SEEK. What I want to do is set this value, the value of the NPVNPV FunctionThe NPV Function is categorized under Financial functions. It will calculate the Net Present Value (NPV) for periodic cash flows. The NPV will be calculated for an investment by using a discount rate and series of future cash flow. In financial modeling, the NPV function is useful in determining the value of a business equal to $500 million by changing the discount rate and press OK. I can see here that the discount rate is 25 percent to get to a $500 million NPV. I’m going to press Cancel and type that answer in this cell here. Now what I’ve done is just essentially taken a note of what the discount rate has to be to get a $500 million NPV. All right, let’s do another example. Suppose that I want 2020 net income to be $10 million, and I want to get there by changing the 2020 revenueSales RevenueSales revenue is the starting point of the income statement. Sales or revenue is the money earned from the company providing its goods or services, income. How much revenue do we need in 2020 to get $10 million of net incomeNet IncomeNet Income is a key line item, not only in the income statement, but in all three core financial statements. While it is arrived at through the income statement, the net profit is also used in both the balance sheet and the cash flow statement.? I’m going to press Alt, A, W, and G for GOAL SEEK, so what I want to do is change this number here, this net income in 2020 to be $10 million by changing this target case revenue as the one that’s currently running in our model, so I need to change that cell, and I see that the target revenue is $122.7 million. Press Cancel and type here 122700, so that’s the revenue that’s required to get there. This is how I can summarize an important information down here using GOAL SEEK. Just a little bit of housekeeping here, I’m going to put a border Alt, H, B, P to put a border across the top there, and here I’m going to say goal seek analysis, in brackets What-if, and I’m just going to put a border over this section here, Alt HBP, and I can select these cells here, press Shift + Spacebar and Alt, D,G, G to group those. Now everything rolls back up to a nicely organized spreadsheet.